Sunny. Warmer. High 72F. Winds SW at 10 to 20 mph..
Former Wyoming Sen. Tom Lockhart talks to colleagues on the Senate floor during the first day of the 2014 budget session at the Wyoming Capitol in Cheyenne. House Speaker Steve Harshman announced Monday that Lockhart had died. 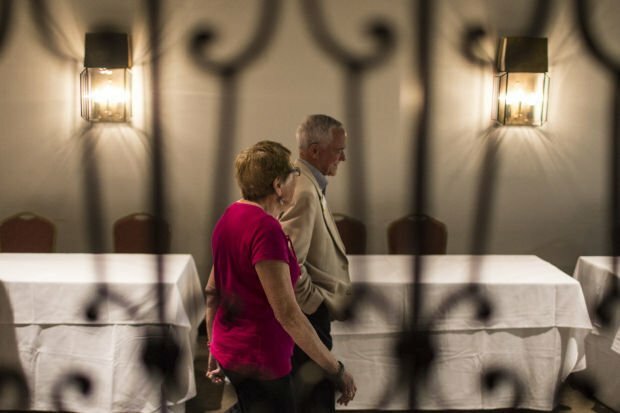 Rep. Tom Lockhart and his wife Lynn leave following a 2014 legislative debate at the Parkway Plaza Hotel & Conference Centre in Casper. House Speaker Steve Harshman announced Lockhart's death Monday at the Legislature. CHEYENNE — Tom Lockhart always made time to mentor those younger than him, even as he used a “velvet hammer” to lead one of the Wyoming Legislature’s most prominent committees for more than a decade, his friends said. House Speaker Steve Harshman announced Lockhart’s death Monday morning. The longtime state representative from Casper was 82 years old. A Republican, Lockhart served as a state representative from 2001 until his retirement in 2016. He represented House District 57, which covers much of southeast Casper. Thomas A. Lockhart was born in Casper and attended Natrona County High School and the University of Wyoming, according to the Legislative Service Office. He entered the House in 2001 and served as chairman of the minerals committee from 2005 until his retirement. Lockhart had strong support from many in the Casper community and was an active member of the Rotary Club. Richard Schwahn, president of the Casper club, said Lockhart joined Rotary in 1992 and served as a devoted member every year since. “He would have been here today, even in this weather,” Schwahn said, as this winter’s worst storm dumped about a foot of snow on Casper. Schwahn said he, like many others in the club, often sought out Lockhart for advice. Lockhart went out of his way to welcome Lisa Scroggins to Casper after she moved here in 2016 to become the executive director of the Natrona County Library. He sought her out at a Rotary meeting and visited her at work to make sure she was settling in. “He genuinely had this spirit about him of openness and welcoming,” she said. Scroggins remembered volunteering with Lockhart and his wife, Lynn, on a cold and misty day to pick up litter along Casper’s trails. The day was indicative of the couple, Scroggins said. They were always eager to serve, no matter the circumstances. Former Casper state representative Tim Stubson said Lockhart was known to lead with civility and respect, but would use a “velvet hammer” to keep his committee meetings orderly. Lockhart helped Stubson both as a young professional who had just moved to Casper and later in the Wyoming Legislature. Lockhart remained an avid runner until his final weeks. While in Cheyenne for legislative sessions, Lockhart would start almost every morning with a run on the treadmill, said Bill Schilling, former president of the Wyoming Business Alliance. His running partner of 15 years, Errol Miller, said the two ran in a race in Boulder in May. Lockhart also served as a steady hand in the effort to diversify Wyoming’s economy, Schilling said. Harshman specifically noted Lockhart’s work on the bill that created the Wyoming pipeline authority during the natural gas boom early in the last decade. Rep. Pat Sweeney, R-Casper, said that Lockhart had been a strong supporter of the University of Wyoming. “There’s a lot of programs and buildings that, without his work, wouldn’t have happened,” Sweeney said. Several lawmakers said Lockhart was instrumental in creating the University of Wyoming’s School of Natural Resources, a legislatively-driven program at the university. He also served for 11 years on the university’s Energy Resource Council, helped secure funding for the new High Bay Research Facility and helped lead the school to become a leader in energy research, Harshman said. Senate President Eli Bebout briefly overlapped with Lockhart in the House and later served with him as co-chair of the joint minerals committee. Bebout said the two worked closely on creating a fund with tens of millions of state dollars to help remediate landfills that local towns could not afford to manage any longer. Lockhart, a veteran of the Korean War, also worked on several bills to improve the lives of Wyoming’s veterans, said David McNulty, who used to be director of Veterans Employment and Training for Wyoming. The two men worked together to pass some of those bills. “He was so enthusiastic about Wyoming, he always tried to make it a better place,” McNulty said. The former representative also inspired respect across the aisle, with Democratic candidate for governor Mary Throne mourning his passing on social media. Throne was a state lawmaker from Cheyenne and served with Lockhart in the House. In 2014, Lockhart narrowly prevailed in a vicious primary battle with local radio host Chuck Gray, who attempted to outflank Lockhart on the right. When he retired two years later, Gray won the race for his open seat.